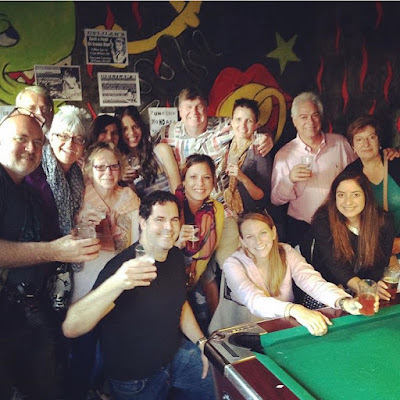 Not only was I lucky enough to participate in a food tour when I was in Chicago last month, I also had the opportunity to do a beer tour, which is something I'd never done before while traveling. I am definitely a beer girl over any other type of alcohol (read about my Struggle with Port Wine), but I also am now in my 30s and (very) unable to drink as much as I did in my college glory days, so I was curious how the day would go. Kristyn and I prepped for our Chicago Beer Experience tour of Lakeview & Lincoln Park by lining our bellies with carbs at Elly's Pancake House. All geared up for a day of drinking, we met our tour guide, Phil, and the rest of the group at Harrigan's Pub. I loved the place immediately because of the Irish coins decorating the bar, underneath the glass. I learned the most at this first stop because as the day went on, I became more affected by the intake of beer and stopped being such a good listener, which I imagine was also the case for the rest of our group. It was at Harrigan's where we learned how to taste beer, which strangely enough is not by chugging it down quickly after the opposing team sinks a shot during beer pong, or via a funnel. First, you look at it to see the color and cloudiness, then you smell it, then you sip it and "chew" it. I wouldn't recommend using the chewing beer method on a date, but it allows you to experience the flavor way better than just sipping. Phil also told us a fun story, which may or may not be an urban legend, about a man who, for Lent, gave up eating and drinking everything, except for beer. After the 40 days, he went to his doctor for tests, and he was in great health and had even lost 15 pounds. The only thing he was at risk of was scurvy, which theoretically, could be helped if the man had eaten some sliced oranges on the edges of his beer glasses, like those served with Blue Moon & Hoegaarden. The bartender at Harrigan's served us four beer samples, all of which I enjoyed. The first was a mystery "Award-Winning Chicago Beer," which I won't reveal the name of, in case you are going on this tour as well. The name or reputation of something as a cheap, college beer can cloud your impression of it, so making this a blind tasting was a good idea. The second beer was a "properly-poured Guinness." I've certainly had Guinness a few times, but typically in carbombs or sips from others' glasses at dive bars, and it's quite possible I haven't had one that is properly poured. I always thought I didn't like Guinness, which made me feel like a bad Irish person. Instead, it turns out I do like it, which is awesome and makes me feel like a *good* Irish person, although I still am iffy on Jameson. Our third tasting would have been a 312 Urban Wheat Ale from Goose Island, but the keg ran out, so it was replaced with a Green Line American Pale. I had ordered the 312 Urban Wheat the night before, so I was happy to be trying something new, although I liked the 312 a lot. Our last beer was an Elliot Ness Amber Lager - named, cheekily, after the famous Prohibition agent. The next stop on the tour was Paddy Long's, where we sampled not only three beers, but also three types of bacon. We had a Krankshaft Kolsch paired with Irish thick slab bacon, a Dark Horse Pale Ale with peppercrusted Bacon, and an Old Chub Scotch Ale Nitro, with jowl bacon. At this point in the day, my pancakes were just a memory, so I may have been more focused on the bacon-tasting than the beer-tasting. The peppercrusted was my favorite, but I wouldn't have been upset to have another serving of any of them. We then walked to Bodega Ramos, our only stop on the tour which was not a bar. It is a specialty store offering craft beer, wine from smaller vineyards, and creative spirits. It was here where we learned more about the ingredients of beer and how beer is actually made, but it was also here where things became a little blurry for me. Three more beer samples were provided to us: Oktoberfest Revolution, Domaine DuPage, and Cain and Ebel, the last two from Two Brothers. We also received a snack pairing here - though sadly, not more bacon - some spicy peanuts from Bee's Knees Food Company. During the last two stops, I got a little caught up talking with our other tour group members, most of whom were from the Midwest and the South and had way cooler accents than I do. But I think this is part of the joy of the tour. Everyone loosens up a little and has a great time, with folks you wouldn't necessarily meet otherwise. At Atlas Brewing Company we had three more beers from the brewing company themselves - Oktoberfest Marzen, Diversey Pale Ale, and Glasgow Kiss Scotch Ale - and learned all about the history of Prohibition in Chicago. We ended our tour at Delilah's, where a bar has been in the building since the 1800s, and a speakeasy for a few years during Prohibition. We wrapped up with a Stevens Point Oktoberfest while the bar went wild over the Buffalo Bills game. Despite our pancakes, the bacon, and the peanuts, Kristyn and I needed to fill up on food desperately after drinking as much as we did on the tour. Luckily, the day before, we had gone to one of the 12 famous Garrett Popcorn shops and each purchased a bag of half caramel, half cheese popcorn. When we got back to Kristyn's place, I went to town on my bag and everything was wonderful. Thank you, Chicago Beer Experience, for hosting us on this tour. At the time of this post, tours are $59.90 per person, $39.90 if attending without the beer tastings. Chicago Beer Experience also offers a tour of the Bucktown & Winter Park areas of Chicago. Opinions are always my own. So fun! Should we go on one together?? ?